Midwest Wrecking Co. of Texas, Inc a Fort Worth Demolition and Dallas Demolition and Implosion company, demolishing structures in Texas and surrounding states. Over 31 years, we have successfully completed thousands of demolition projects with an average of 150 projects per year. We have demolished just about every type of structure you can imagine. We work on residential and commercial demolitions of all sizes including the second tallest building ever imploded. We approach each project first and foremost with safety in mind. That is why we have never had a general liability claim against our company while maintaining an “Experience Modifier Rate” or EMR of .73. This commitment to safety and excellence is reflected by the fact that most of our demolition projects are completed on behalf of repeat customers. The demolition professionals at Midwest Wrecking work hard to exceed our customers’ expectations when partnering on a project. That is why they come back to us again and again for all of their demolition and implosion needs. Here at Midwest Wrecking, our goal has always been to work safely and efficiently while providing our clients the level of service that they deserve. Our Ft. Worth and Dallas demolition clients include general contractors, trade contractors, individuals, developers, governmental agencies, and public and private institutions. We take pride in working on all projects regardless of the level of difficulty. In fact, difficult or nontraditional projects are our specialty. From high-tech implosions to conventional demolition, our team has the experience and knowledge to get the job done right along with the professionalism to make you a customer for life. 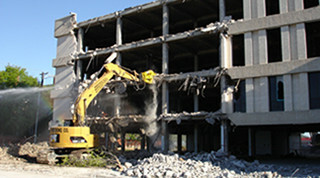 If you require the services of a reliable Fort Worth Demolition and Dallas Demolition and Implosion company, contact the experts at Midwest Wrecking Co. of Texas. We offer a wide array of services, and our team will gladly answer all of your questions. We’ll assess your needs and determine the overall size and scope of your project. Doing so will help our team develop a plan on how to proceed in terms of safety and efficiency. Call Midwest Wrecking today for all of your residential or commercial demolition and implosion related needs. We provide bridge demolition services. Midwest Wrecking Co. of Texas, Inc.